Akaganeite: Mineral information, data and localities. The presence of akaganeite indicates high concentrations of chloride in an acidic environment (Ståhl et al. 2003). Note: The spelling akaganéite is incorrect (Burke, 2008). Microcline 2 photos of Akaganeite associated with Microcline on mindat.org. Goethite 1 photo of Akaganeite associated with Goethite on mindat.org. Spinel Group 1 photo of Akaganeite associated with Spinel Group on mindat.org. Mackay, A.L. (1962) β-ferric oxyhydroxide - akaganéite. Mineralogical Magazine: 33: 270-280. American Mineralogist (1971), 56, 659. Murad, E. (1979) Mössbauer and X-ray data on β-FeOOH (akaganéite). Clay Minerals: 14: 273-284. Buchwald, V.F. and Clarke, R.S., Jr. (1989) Corrosion of Fe-Ni alloys by Cl-containing akaganéite (β-FeOOH): the Antarctic meteorite case. 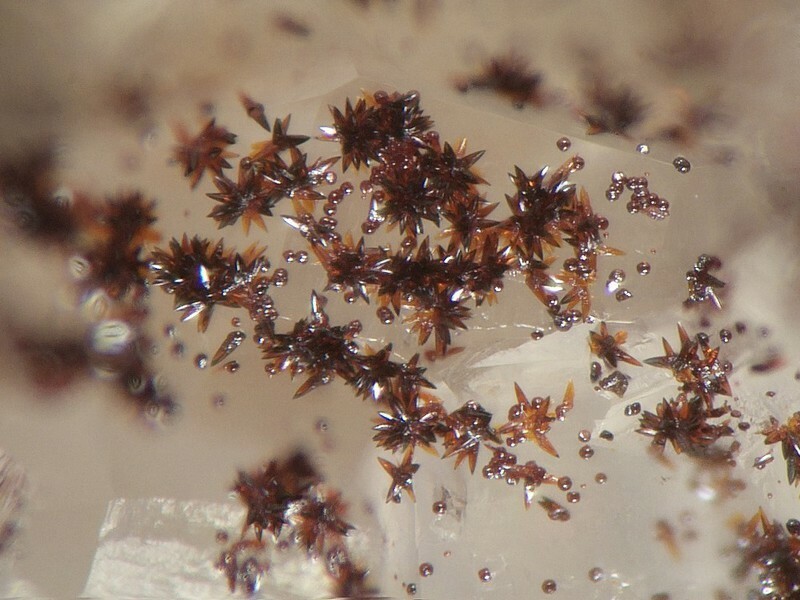 American Mineralogist: 74: 656-667. Post, J.E., Buchwald, V.F. (1991) Crystal structure refinement of akaganéite. American Mineralogist: 76: 272-277. Anthony, J.W. et al. (1997) Handbook of Mineralogy, Vol. 3, 7. Post, J.E., Heaney, P.J., von Dreele, R.B., Hanson, J.C. (2003) Neutron and temperature-resolved synchrotron X-ray powder diffraction study of akaganéite. 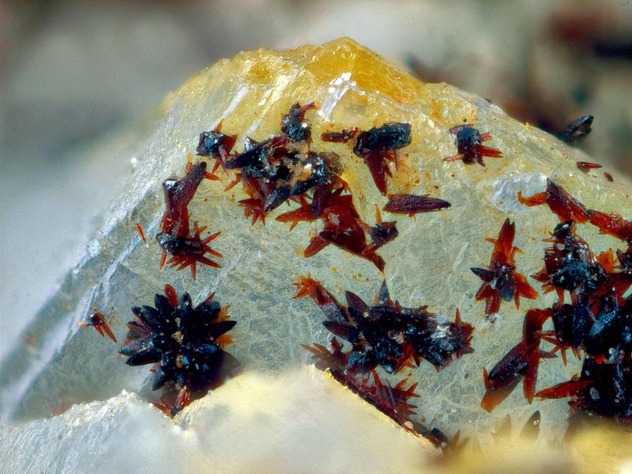 American Mineralogist: 88: 782-788. Ståhl, K., Nielsen, K., Jiang, J., Lebech, B., Hanson, J.C., Norby, P., van Lanschot, J. (2003) On the akaganéite crystal structure, phase transformations and possible role in post-excavational corrosion of iron artifacts. Corrosion Science: 45: 2563–2575. 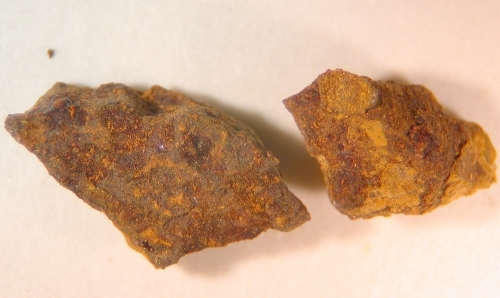 Holtstam, Dan (2006) Akaganéite as a corrosion product of natural, non-meteoritic iron from Qeqertarsuaq, West Greenland. Gff-Uppsala: 128(1): 69-71. Rémazeilles, C., Refait, P. (2007) On the formation of β-FeOOH (akaganéite) in chloride-containing environments. Corrosion Science: 49: 844-857. Burke, E.A.J. (2008) Tidying up mineral names: An IMA scheme for suffixes, hyphens and diacritical marks. Mineralogical Record: 39: 131-135. Scheck, J., Lemke, T., Gebauer, D. (2015) The role of chloride ions during the formation of akaganéite revisited. Minerals: 5(4): 778-787. Peretyazhko, T.S., Fox, A., Sutter, B., Niles, P.B., Adams, M., Morris, R.V., Ming, D.W. (2016) Synthesis of akaganeite in the presence of sulfate: Implications for akaganeite formation in Yellowknife Bay, Gale Crater, Mars. Geochimica et Cosmochimica Acta: 188: 284-296. Kuebler, K. E. (2013) A comparison of the iddingsite alteration products in two terrestrial basalts and the Allan Hills 77005 martian meteorite using Raman spectroscopy and electron microprobe analyses: Journal of Geophysical Research: Planets 118 (4): 803-830. (Apr 2013). Bogdanov, Y.A., Vikent’ev, I.V., Lein, A.Y., Bogdanova, O.Y., Sagalevich, A.M., and Sivtsov, A.V. (2008): Geology of Ore Deposits 50(2), 119-134.
samples analysed by Anthony Kampf, Curator Emeritus of Mineral Sciences at NHM of LAC, California; Kampf, A.R., Sciberras, M.J., Williams, P.A., Dini, M. & Molina Donoso, A.A. (2013): Leverettite from the Torrecillas mine, Iquique Provence, Chile: the Co-analogue of herbertsmithite. Mineralogical Magazine 77, 3047-3054. Schnorrer, G. (1993): Mineralogische Notizen VI. Aufschluss, 44, 44-58. Blaß, G. & Graf, H.W. (1993) Neue Funde. Mineralien-Welt, 4 (2), 57-60.; Bender, D. and Krimmelbein, W. (1994) Aktuelle Übersicht: Mineralien der Zinkhütte Genna/Sauerland. Stand Juni 1994. Mineralien-Welt, 4/94, 10. Schnorrer-Köhler, G., Standfuss, L. & Standfuss, K. (1991): Neue Funde aus den antiken Schlacken von Lavrion, Griechenland. Lapis, 16 (6), 21-23; 58. Ara D., Sanna L., Rossi A., Galli E., De Waele J. (2013): Minerali secondari in ambiente sotterraneo: la miniera dell’Argentiera (Sardegna nord-occidentale). In: Cucchi F., Gudi P. (eds. ), Atti del XXI Congresso Nazionale di Speleologia “Diffusione delle conoscenze”, Sessione Attività di esplorazione e ricerca. Trieste 2-5 giugno 2011. Edizioni Università di Trieste, Trieste, 290-295. Int. Assoc. of Collectors of Slag Minerals, 10 (2), 4-6. Jansen, H. & van den Berg, W. (1998): Slakkenmineralen in Toscane (Italië). Gea, no. 4, 109-117 (in Dutch). Cerutti, G., Preite, D. (1995): Mineralien der etruskischen Schlacken von Baratti, Toskana. Lapis, 20, 4, 13-18 and 50. Johnston, J. H. (1977) Jarosite and akaganéite from White Island Volcano, New Zealand: an X-ray and Mossbauer study. Geochimica et Cosmochimica Acta 41:4, 539-544. Railton, G.T., Watters, W.A. (1990) Minerals of New Zealand. New Zealand Geological Survey Bulletin 104, 89 pages. D. Holtstam and J. Söderhielm : "The Muonionalusta iron meteorite from Lapland, Sweden : New finds and findings", 5th International Conference "Mineralogy & Museums", Paris, Sept. 5-8th 2004, Bull. de Liaison de la Soc. Franç. de Minéralogie et Cristallographie, 2004, Vol 16, N°2. Ryback, G., and Tandy, P.C. (1992): Mineralogical Magazine 56, 261-275; Golley, P., and Williams, R. (1995): Cornish Mineral Reference Manual. Endsleigh Publications (Truro), 104 pp. ⓘ Ithaca Peak Mine (Mineral Park Mine; Ithaca Peak orebody; Ithica Peak Mine) ? Anthony, J.W., et al (1995), Mineralogy of Arizona, 3rd. ed. : 103; Eidel, J.J., et al (1968), Copper-molybdenum mineralization at Mineral Park, Mohave Co., AZ, in J.D. Ridge (ed. ), Ore deposits of the United States, 1933-1967, A,I,M.E. : 1258-1281. Anthony, J.W., et al (1995), Mineralogy of Arizona, 3rd.ed. : 103. Mokhov A.V., Kartashov P.M., Bogatikov O.A. (2007) Moon under a microscope, - Moscow, Nauka, p.128 (in Rus. ).